TOS is a disorder of nerves. Various other tissues, such as muscles, blood vessels, and the gastrointestinal tract, can be affected, but this is due to the primary disturbance in the nerves. The nerves affected course from the neck and chest (C4-5 to T1-2, the brachial plexus) through the space above the collarbone, which is bound by small muscles, scalenes, first rib, and the collarbone (clavicle).They go on to innervate primarily the arm, coursing below the prominent shoulder bone where they can also be compromised. Offshoots from these nerves turn backward to the spine, frequently involving the neck and head; forward to the front of the neck, involving the voice box and occasionally the esophagus; backward to the shoulder blade; and downward to the front of the chest and breast. The accompanying drawings illustrate some of these relationships. 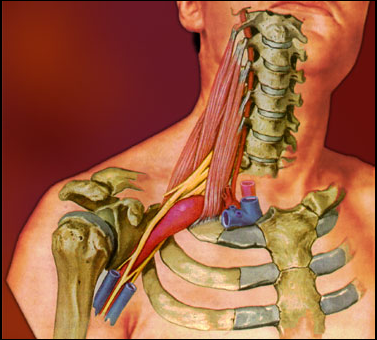 The nerves emanating from the spine crisscross in the space above the clavicle in close proximity to a large artery and vein, which can contribute to the irritation that occurs in TOS. Fibrous bands can also squeeze these complicated nerve bundles, although they often occur without giving rise to any symptoms. Basically, a tunnel comprised of hard tissue (the rib), bound by a variety of other tissues (muscles, fibrous strands, and blood vessels),supplies the innervation for the upper quadrant of the body. An abnormal increase in factors that cause further irritation- such as a bony callus from a fractured rib or, more likely,collarbone; pumped-up muscles from weight lifting; or traumatized muscles from activities such as competitive volleyball -can compromise this space and irritate these large nervebundles. Abnormalities in the blood vessels, such as clotsor dilatations, can produce the same effect. Movement of the shoulder and arm changes all of these relationships. If one imagines a triangular pyramid with the corners of the base at the spine, at the chest bone, and deeper at the first rib, and the apex at the shoulder, one can see that elevating the tip of the pyramid brings the adjacent sides closer together, squeezing the contents. Over-the-shoulder movements, hunched backs, or reaching all produce this constriction.Once these large nerves become compromised, constriction further aggravates their irritability and increases symptoms. To complicate matters, in the vast majority of cases, the site of injury is not easily determined since it resides inside the nerve trunks.